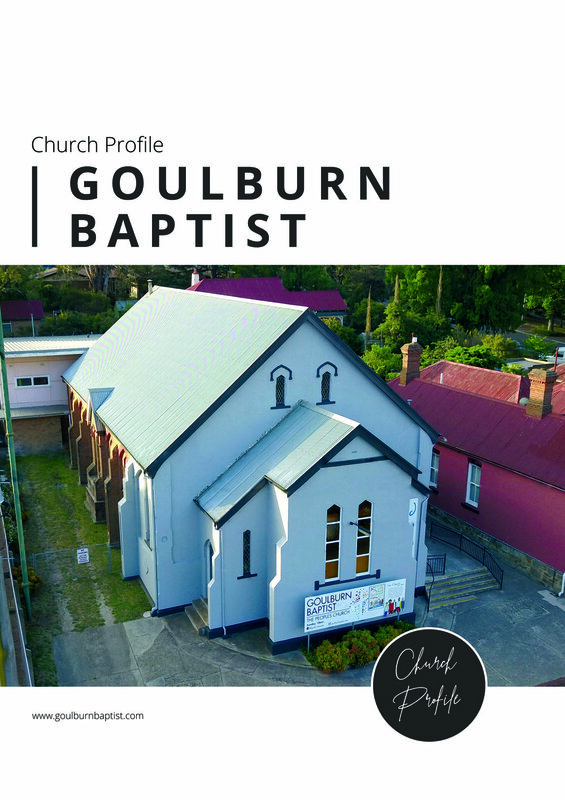 Goulburn Baptist Church is located in country New South Wales - an hour from Canberra and two hours from the heart of Sydney. We are seeking a part time Pastor to lead our church, working three days a week alongside our passionate team of leaders and volunteers. The primary role will be preaching on Sunday mornings at our 10am family service, with occasional speaking roles at the evening service and Friday night Youth Group as appropriate. Due to the part time nature of the role there is a degree of flexibility to allow for the right candidate to work according to their gifts and passions. Leading the congregation and church membership as a whole, with particular focus on the morning service, but with a heart to reach and grow the younger generation through the evening and Friday night services. Providing discipleship and equipping others to disciple well. Supporting and encouraging the ministry volunteer teams. Providing pastoral care to the congregation and community in conjunction with the Pastoral Care Coordinator. Connecting with those in the church through fellowship and hospitality. Building upon the culture of family and community to strengthen and grow the church. Each of these responsibilities shall be realised in committed consultation and agreement with the Pastoral Team of Goulburn Baptist Church and the Church Leadership. Regular pastoral reviews will be in place and the stipend, allowance, leave and accommodation will be in accordance with the Baptist Association’s guidelines. A strong and personal relationship with God, with the integrity and character required of a Christian leader. Excellent knowledge and understanding of the Bible and theology – formal theological training is desirable but not essential. Bible-based preaching, with a passion for teaching the Word of God in a relevant and relatable way. Theology that aligns with the core beliefs of the NSW/ACT Baptist Association, including believers’ baptism, and communion. The ability to work as part of a team and be proactive. A strong work ethic, a willingness to put in the time and effort needed to meet your responsibilities. A Christlike willingness to nurture those entrusted to your care with self-sacrificial love. Excellent leadership skills, with proven experience in leading Christian ministry. The ability to work well with administrative and spiritual leadership teams to ensure the effective running of the church. An openness to communicate personal and professional needs and boundaries to ensure effective management of the position. A willingness and ability to minister to people from diverse ethnic backgrounds and age groups. A heart to grow the church, reach our town for God’s kingdom, and to fully embrace our church as your spiritual home. A cover page addressing your suitability for this position. Please refer to the core responsibilities and the essential qualities outlined above, as well as the Church and Pastoral Profiles below. Your current CV along with two personal and two professional referees. A one page outline of your understanding of the core doctrines of the faith. A completed Pastoral Profile. A pro forma template is available by contacting us (details outlined below).